At last, someone has created a device to thrash the ugly off Julia Roberts! 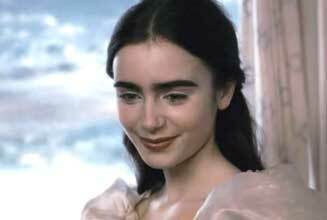 Snow White with a unibrow! Unnecessary special effects (that are not that special when overused to this extent), intentionally juvenile performances and irritating editing make this colorful, campy adventure as teeth-grating as biting into a poisoned apple. Writers Marc Klein, Jason Keller and Melisa Wallack, and director Tarsem Singh, have worked hard on constructing a new-ish story, with good foreshadowing, plot points and payoffs. But trying to make the exercise more tolerable by having every actor adopt a modern comedic vernacular works about as well as claiming the Queen is supposed to be beautiful and then casting Julia Roberts in the role. The Queen gains control of the kingdom via dark magic, her king riding off to battle some ambiguous “evil” and never returning. Her stepdaughter Snow White (Lily Collins, who must unfortunately share a dressing room with her unibrow), is apparently an annoying 18-year-old with nothing to do about the palace except get underfoot. Queen Roberts cannot put her finger on why Snow annoys her so: “After all, you’ve done nothing to me. Caused no problems. And yet… there is something about you that’s so incredibly… irritating. I don’t know what it is. The slumped shoulders, the hair, that voice. Mmm…” Ditto to Julia Roberts. I would ask her whether she’s looked in the mirror lately, but I know the answer to that one. Please, Ms. White, free the caterpillar and let it live free on a leaf somewhere! Queen’s vaunted magic mirror doesn’t have much bearing on this story, except to warn Queen that using magic has its price; that price, I presume, has something to do with being in a movie almost unwatchable. When Snow expresses interest in Prince, Queen orders Brighton to kill her in the forest. Which he doesn’t. Abandoned Snow meets the Dwarfs and a training montage ensues, making her a warrior in five minutes. Now she’s ready to save the kingdom at the 80-minute mark, leaving enough time to tie up loose ends with peripheral characters and still make it under the 100-minute mark so that the studio can profit from maximum amount of screenings. aka: SNOW WHITE AND THE SEVEN DWARFS. Writers: Marc Klein, Jason Keller, Melisa Wallack. Starring: Julia Roberts, Lily Collins, Armie Hammer, Nathan Lane, Martin Klebba, Jordan Prentice, Mark Povinelli, Joe Gnoffo, Danny Woodburn, Sebastian Saraceno, Ronald Lee Clark, Robert Emms, Mare Winningham, Michael Lerner, Sean Bean.